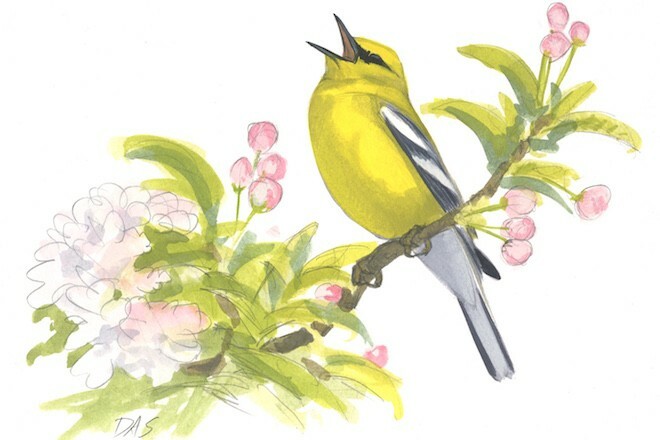 Blue-winged Warbler (above) sings one song type for females (beee-bzzz), and another song for males (a stuttering buzz). 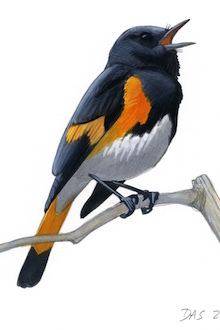 American Redstart (below) repeats one song over and over for females, and gives a more varied performance for males, alternating up to four songs. Art by David Allen Sibley. A key to appreciating bird song is learning to decipher a little bit of its meaning. 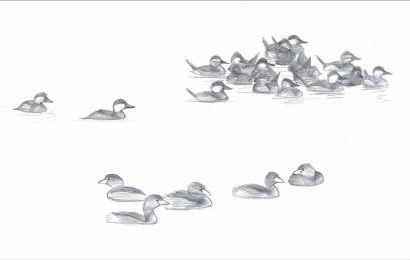 Most of the information it contains is beyond our understanding, but one feature is relatively easy to hear and can be revealing: whether successive songs from an individual bird are the same or different. In most songbirds, each male will use a repertoire of several songs in his performance. You will have to listen closely to hear enough details to compare one song to the next, but as you get tuned in, the differences will become more noticeable. American Redstart, male. Art by David Allen Sibley. 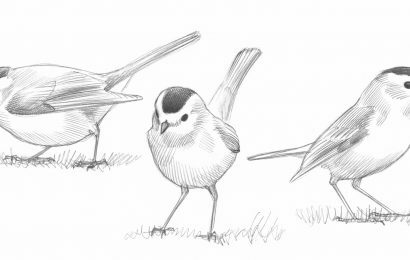 The two primary (but separate) functions of a bird’s song are attracting a mate and intimidating rival males. In many species, the repertoire is used differently for each purpose. By paying attention to the singing performance, you can deduce a lot about a bird’s social life. Each male Song Sparrow, for example, has a repertoire of about 10 song types, and he normally sings each one around 10 times before switching to another. 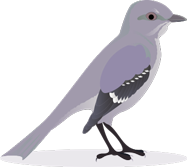 The male switches types more often as the intensity of an aggressive encounter escalates, and in those situations he often counter-sings (matches songs) with a rival male. In American Redstart, each male has a repertoire of up to four songs, but he uses them differently than Song Sparrow. When performing for a female, the redstart sings one song over and over. But when confronting another male, he alternates different songs, singing each song once before switching. In many other warbler species, males have just two song types in their repertoire; they use one for females and the other for males. 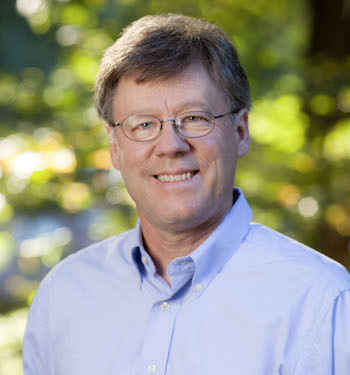 In all of these species, the singing is also linked to other behavior. 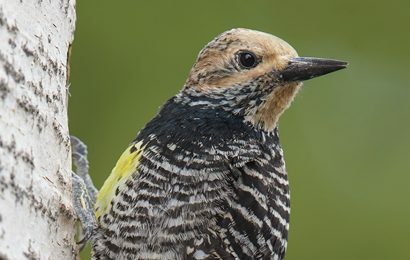 Singing for the female peaks early in the season and is heard all over the territory and through the middle of the day, as the male follows the female. Singing for rival males is a dawn and dusk ritual throughout the spring and summer, and it is also done whenever a threat is detected, typically from a high exposed perch and at the edges of the territory. Listen carefully to the sounds of species in your neighborhood. 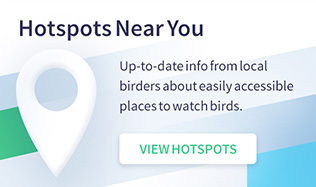 Not only will the experience help you get to know common birds, but it will make learning the sounds of the next 100 species much easier. 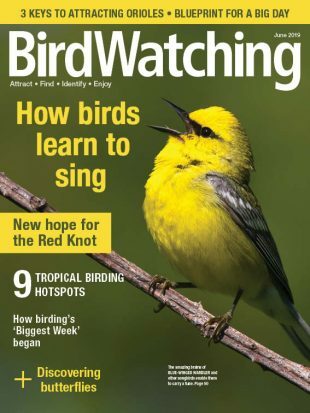 This article from David Sibley’s “ID Toolkit” column appeared in the May/June 2016 issue of BirdWatching.